Delight in beachfront Shipwatch Surf and Yacht Club, for relaxation, for boating, for pure enjoyment. This unique property is located on 500 FT of beach front and also offers old river access across the street. These spacious condos boost a Southern Living, cottage atmosphere. 1364 SF and beautifully furnished with ceramic tile throughout. Electronics include 40" TV, DVD, CD-Stereo in Living Room, 32" TV, DVD, VCR in Master and 20" TV, DVD, VCR in one Guest Bedroom. It was a pleasure working with Perdido Realty. Overall a very pleasant stay. The condo was beautiful and the weather great for our "too short" stay. We were at Shipwatch D and rented the party room. The elevator broke or got stuck on the third floor one evening. Luckily we were only on the second floor and it was a pretty easy walk up one flight. Always available to answer questions and address concerns with the condo. Very friendly and helpful. 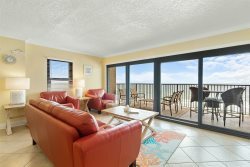 I have been staying at your property for the last 20 years and have always enjoyed being away from the hustle bustle of Orange Beach but close enough to enjoy the amenities of both Orange Beach and Gulf Shores. Property is well maintained and staff at Perdido Realty friendly and welcoming. Hope to see you next year! Love D204. All the conveniences of home with a glorious view. Perdido Realty friendly and helpful. So thoughtful informing us of availability of early check in. With a 9 hour drive it gave us an extra day by driving halfway! Shipwatch D204 was pretty and decorated nicely!